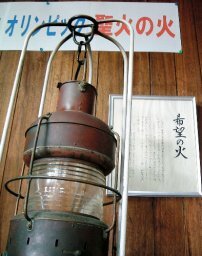 It was called the Flame of Hope – a flickering flame kept alive in a boat lantern in the city of Kagoshima. Until it wasn’t. The sacred flame came to Japan after being ignited in Olympia, Greece, and traversing South, Southeast and East Asia. When the flame arrived in Kagoshima on September 9, 1964, one of the many torch relay runners, a sports store owner, took his torch back home with the flame still alive. When the principal of the local elementary school saw the flame, he said he wanted his students to see it. And thus was born the idea to keep the Olympic flame alive, where it finally settled in a city youth training center. It was called the Flame of Hope. And for decades, residents of Kagoshima would over the years request the honor of using the Olympic flame to ignite fires for weddings, festivals and camp outings. For all intents and purposes, the Flame of Hope became an Eternal Flame, at least that is what the people of the youth training center dedicated to protecting. According to that AFP report, the head of the center was feeling considerable pressure at that time as the news of Tokyo’s selection for the 2020 Olympics was bringing considerable attention to Kagoshima and the legacy of the eternal flame from 1964. “At that time, I could not say something that could destroy (people’s) dreams,” added the official, who declined to be named. With so many people requesting use of the Flame of Hope, the guilt over deceiving the public had reached its breaking point, so he recently decided to come clean. In the past four years, the Flame of Hope had actually been re-lit by a magnifying glass and sunlight in December, 2013. To be fair, the Olympic flame has a history of being extinguished, particularly those held by runners during torch relays, most recently when striking teachers disrupted the torch relay prior to the 2016 Rio Olympics. But you have to feel for the employees of the Kagoshima youth training center – to see hope flicker out before their very eyes. Fortunately, hope takes on many forms, and still fuels expectations for greatness in 2020. This is part two highlighting the powerful black and white photos of the opening day ceremonies of the 1964 Tokyo Olympics, 53 years ago yesterday. The photo above, from this series compiled by Fuji Film, captured one of the most dramatic moments of the Tokyo Games. The sacred flame that lit the Olympic cauldron, which burned for the 16 days of the Tokyo Olympics, was initially lit 51 days earlier on August 21 in Olympia, Greece. The flame then travelled through 12 countries in Eurasia, including Turkey, Lebanon, Iran Thailand, Malaysia and Taiwan, before landing in Japan. The flame was distributed to four torches, which then made their way through all prefectures in Japan. The four flames came together in Tokyo and the final torch bearer was Yoshinori Sakai, a university runner selected because he happened to be born on August 6, 1945 in Hiroshima, the day the world entered the nuclear war age. After the Olympic cauldron was lit, the flag bearers of the 93 nations formed a semi-circle around the lectern, where Japanese gymnast Takashi Ono, stood. 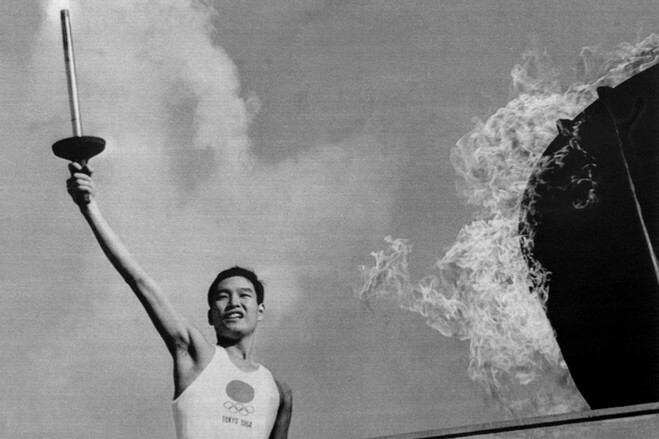 Ono, a veteran participating in his fourth Olympics, who accumulated 5 golds and 13 total medals since the 1952 Helsinki Games, delivered the athlete’s oath. In the name of all competitors, I promise that we shall take part in these Olympic Games, respecting and abiding by the rules that govern them, in the true spirit of sportsmanship, for the glory of sport and the honor of our teams. After the oath, 8,000 pigeons were released. I’m sure it was a spectacular image on television and in the newspapers and magazines, but it was a bit of an annoyance to athletes and spectator alike who tried and failed to dodge the guano bombs of the birds who were probably less than thrilled with being cooped up in cages and then suddenly released into the air above the stadium. One athlete told me that the water pressure in the Olympic Village dropped drastically as everyone showered at the same time to rid themselves of their unwanted opening day souvenir. October 10, 1964. In the annals of 20th century Japanese history, it was truly a day to remember. Bob Costas, the voice of NBC Sports for decades, has announced he is stepping away from his desk as Prime-Time host of the Olympic broadcasts. After this announcement, Costas made the media rounds, including this interview, where he remarked on his favorite Olympic moment – the lighting of the Olympic cauldron by Muhammad Ali at the 1996 Atlanta Olympics. As Costas recalled on the radio sports program, Mike & Mike, “It was both dramatic and completely stunning!” After all, the producers kept it a secret as to who the final torch bearer would be until the very last moment. No more than 10 or 12 people on the whole planet even knew that he would be the last torch bearer. And when Janet Evans, that great Olympic swimmer climbed up the steps carrying the torch, got to the top, Muhammad literally stepped out of the shadows. So no one saw him until the very moment that he got the torch. And Janet handed him torch and you heard in that stadium something you almost never hear in an arena or stadium. You hear lots of sounds in a sports event, but you almost never hear an audible gasp. And that’s what you heard that night, because people were so stunned to see Muhammad Ali. And here was this man, who once was one of the most physically beautiful and nimble of athletes, reduced to a man trembling, trying to hold onto that torch and light the cauldron, and yet somehow, even in that condition, there was something so dynamic and magnetic about it. And he was once one of the most vocal of athletes and by that time he had been reduced to virtual silence. And yet in that moment, he was just about as profound as he had But there was something truly unique about that moment. And every time I think about it, even now, and I’ve recounted it a couple of times in the last 24 hours when people have asked me the question you’ve just asked me, every time I think about it, I still get goosebumps. Here is a short clip from an ESPN piece about that moment. Edward Seidensticker was a translator from Japanese to English, and was so proficient in Japanese that by the time the Tokyo Olympics rolled around in 1964, he had already translated the works of Japanese novelists Niwa Fumio and Tanizaki Junichiro. He would go on to translate one of the world’s earliest novels, “The Tale of Genji” as well as the works of Kawabata Yasunari, which led to his selection as the first Japanese to receive a Nobel Prize. But his formative years as a young adult was as a translator for the US Marines in the Pacific War, as well as in Post-War Japan during the American occupation. And in the weeks leading up to Tokyo Olympics, Seidensticker reportedly stuck his neck out. 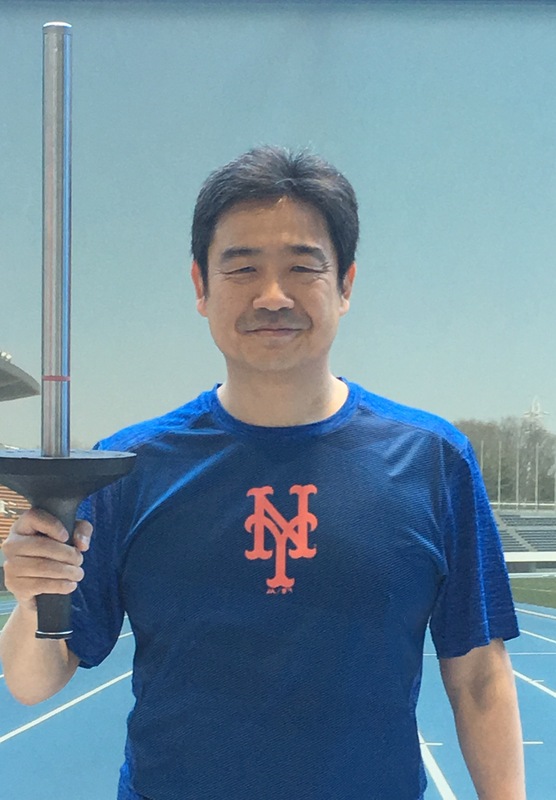 It was already news that the Tokyo Olympic Organizing Committee had selected a 19-year-old freshman from Waseda University named Yoshinori Sakai to run into the National Olympic Stadium, carry the sacred Olympic torch up the steps and then light the Olympic cauldron. Sakai was born on August 6, 1941, in Hiroshima, the day an atom bomb was dropped on that city. Seidensticker was reported to have objected to this particular selection, saying that choosing Sakai was not “incidental”, and that it was “unpleasant to the Americans”. When a member of the International Olympic Committee was asked to comment on Seidensticker’s reaction, G. D. Sondhi of India, who had just witnessed Sakai’s torch lighting at the opening ceremonies, replied “He is good and I’m happy to see him do it so nicely. We must bring young people in the Olympics and let those old men just sit and help them.” Sondhi went on to say in an article from the October 11, 1964 Mainichi Daily News that he did not think Sakai’s selection to be political, and rather thought that Sakai was “a big hope” for Japan, and was “the most touching of all Olympic ceremonies I ever saw”. Take a look at the first 10 minutes of Kon Ichikawa‘s classic documentary, Tokyo Olympiad. Ichikawa shows in dramatic fashion the blazing sun, old buildings being demolished making way for modern-looking stadiums. Ichikawa charts the path of the sacred flame, ignited in Greece, and carried in an amazing international relay through the Middle East, South Asia, Southeast Asia, North Asian and finally into Japan. After the torch leaves Okinawa, it arrives in Hiroshima. As you can see at about the 6-minute mark of the film, Ichikawa uses a helicopter to focus in on the famed Hiroshima Dome, its skeletal frame a reminder of the atomic bomb’s power, and a symbol for resilience. The Mainichi Daily News wondered if this scene would also arouse the ire of Seidensticker and others like him. October 1964 was barely 19 years removed from the disastrous end to the war in Japan. Those who remembered the war on both sides could be excused for a nerve unexpectedly exposed on occasion. But I can’t help but believe that the choice of Sakai, born symbolically out of the ashes of Japan’s greatest disaster, was an inspired and most appropriate choice. The torch for the 1964 Tokyo Games was as plain and utilitarian as can be – black handle and thin silver metal cylinder. Over the years, the torch has taken all shapes and forms, with the Winter Games torches in particular tending to the gaudy. But the Rio torch, which will embark on a 3-month journey through Brazil, is both simple and colorful, thanks to an innovative design. A picture of me with a replica of the 1964 Summer Games torch. But, as Wired continues to explain, something happens when you activate the torch and ready it for the flame exchange, or “the kiss” as it is called. Click on this link to see a GIF showing this transformation. The ribbons of gray, blue and green represent the ground, sea and mountains of Brazil, capped off by the golden top of the torch, which represents the sun. The Olympic flame had begun its journey on April 21, born of a spark created by the sun in a parabolic mirror, housed on site at the Temple of Hera in Olympia, Greece. Starting today, May 3, the Rio torch will begin its relay through Brazil, where over 10,000 people will run with the torch for at least 200 meters, taking the flame through some 500 cities and towns across the vast South American nation. On August 21, 1964. the Priestesses of the ancient Temple of Zeus in Athens lit the Sacred Olympic Flame in a bowl using the rays of the sun. The torch was then transported to the site of the Ancient Olympics, where King Constantine II of Greece waited for it with IOC President Avery Brundage and Daigoro Yasukawa, President of the Tokyo Olympic Organizing Committee. Chief Priestess, Aleca Katselli lit the Olympic Torch from the sacred flame, handing it to the King, who handed it to the first runner, George Marcellos, who was the Greek 110-yard hurdle champion. And off he went, initiating the torch on a multi-country, multi-continent relay ending in the National Stadium in Tokyo. Greek hurdler, George Marcello, takes the first leg of the Torch Relay, from the book Tokyo Olympiad 1964, Kyodo News Agency. There is no other way to describe this ceremony – except that it feels Olympian. And so since 1936, the Olympic Torch Relay has been a permanent fixture in the ritual of the Olympic Games.